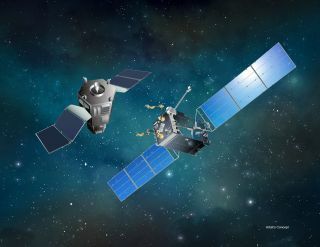 An artist's illustration of a satellite-servicing spacecraft approaching its target. On Aug. 14, 2018, a US diplomat said that a Russian satellite described as a "space apparatus inspector" has been exhibiting “very abnormal” (and therefore concerning) behavior on orbit. It's unclear exactly why American officials are so worked up about a Russian satellite's recent activities, experts say. On Tuesday (Aug. 14), a high-ranking member of the U.S. State Department raised concerns about the satellite, describing its on-orbit behavior as "very abnormal" and implying that it could be a space weapon of some kind. "But Russian intentions with respect to this satellite are unclear and are obviously a very troubling development — particularly when considered in concert with statements by Russia’s Space Force commander, who highlighted that 'assimilate[ing] new prototypes of weapons [into] Space Forces' military units' is a 'main task facing the Aerospace Forces space troops,'" she added. Poblete didn't name the satellite. But she did describe it as a "space apparatus inspector" and said it deployed in October 2017. These clues strongly suggest that the spacecraft is a subsatellite known as Cosmos 2523, which separated from its orbiting mothership on Oct. 30 of last year. Russia didn't launch anything in October 2017 other than the Progress 68 International Space Station resupply vehicle and Europe's Sentinel-5P Earth-observing satellite, said Jonathan McDowell, an astronomer at the Harvard-Smithsonian Center for Astrophysics who monitors many of the spacecraft circling our planet using publicly available U.S. tracking data. So, "there really isn't anything else it could be" other than Cosmos 2523, McDowell told Space.com. This gets a bit confusing, so bear with me: Russia launched the Cosmos 2519 satellite in June 2017. This spacecraft popped out a subsatellite known as Cosmos 2521 in August of that year. On Oct. 30, a second subsat, Cosmos 2523, deployed from one of these two other craft. "I can't tell from the data whether the parent [of 2523] was 2519 or 2521, and indeed, I can't be sure that U.S. tracking didn't swap the IDs of 2519 and 2521 at some point," McDowell said. These three spacecraft then performed a variety of maneuvers over the ensuing months, according to McDowell and Brian Weeden, director of program planning at the nonprofit Secure World Foundation. For example, Cosmos 2521 conducted some "proximity operations" around 2519 and may have docked with the mothership in October, Weeden said via Twitter today (Aug. 16). Perhaps the Russians "are checking out the [spacecraft] bus and its capability to deliver multiple subsatellites to different orbits — something like that," McDowell said. "From the information that's available in the public domain, that would be an entirely plausible interpretation." These three satellites' activities may be related to the military and may have something to do with spacecraft inspection, he added. But McDowell doesn't regard their behavior as "very abnormal," and there's no indication that they've done anything illegal or threatening. So, he's not sure what prompted the concerns expressed by Poblete. "What are they complaining about?" McDowell said, referring to American officials. Weeden voiced similar sentiments. Cosmos 2523's "deployment was unusual, but hard to see at this point why the US is making it a big deal," he said via Twitter today. "There are a lot of facts and not a lot of pattern," McDowell said. "So, partly I take the U.S. statement as saying, 'Russia, how dare you do something confusing?'" It's possible, of course, that American satellites or sensors have spotted Cosmos 2523 (or Cosmos 2519, or Cosmos 2521) doing something suspicious — some activity that can't be detected just by analyzing publicly available tracking data. "But they need to say a little more for us to take that seriously," McDowell said. Editor's note: This story was corrected on Aug. 16 to clarify that Yleem Poblete said the Russian satellite in question deployed in October 2017. The original version erroneously said she referenced an October launch.